If you think the Gong Ride or Around the Bay is a serious challenge, then think again. A few weeks ago I was contacted by a team of women who are training for a huge race/relay called Race Across America that takes place each year in June. 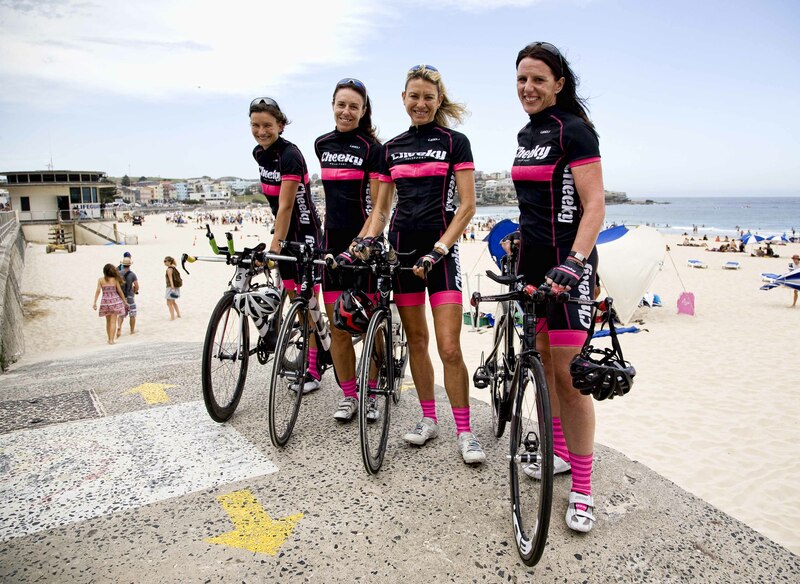 Last year I wrote about two American women tackling it and this time it’s a team of four Australian women calling themselves the Veloroos – Natasha Horne, Sarah Matthews, Julie-Anne Hazlett and Nicole Stanners. Race Across America known as RAAM is a race but instead of being in stages it is one continual ride similar to a time trial. Once the clock starts it does not stop until the finish line. RAAM is about 30% longer than the Tour de France and is not limited to professional cyclists. While solo racers must qualify to compete, anyone may organise a team and race. Racers must traverse 3000 miles (4,828 km) across 12 states and climb over 170,000 vertical feet (51,816 metres). Team racers have a maximum of nine days and most finish in about seven and a half days. Teams will ride 350-500 miles a day, racing non-stop. Solo racers have a maximum of 12 days to complete the race, with the fastest finishing in just over eight days. Solo racers will ride 250-350 miles a day, balancing speed and the need for sleep. Q: RAAM is a pretty serious undertaking, what made you decide to tackle it? Sarah did RAAM as a mixed team last year. In doing so she observed the top female teams battling it out less than 30 minutes apart the whole way across the USA. She thought it would be great to also throw an Australian female team into the mix! JA, Nicole and Natasha are all highly competitive triathletes (nationally and internationally) and RAAM seemed like a challenge they all wanted to experience. Q: I understand that it is like relay with one of you always on the bike, how many hours will each ‘shift’ be? Riders will split into two pairs. Each pair will ride for six hours. Within that six hour period the pair will alternate on and off the bike for pulls of 20 minutes. The plan is not to stop, this means a lot of coordination by the two support vehicles and the RV. We have a fabulous crew team who have already started to map out our route, rotation schedules and alternatives if the six hour rotation needs changing. Q: You all sound like typical busy women from the profiles on your website, how many hours are each of you training per week at the moment? We all vary but Sarah is training 10 to 15 hours a week, depending on shifts. At the moment is still training for ironman so some of that time is spent running and swimming. After the ironman in March she’ll will switch the focus to just riding. JA and Nicole both tackled Three Peaks in March so they are spending a good 12 to 18 hours in the saddle. Natasha is focusing on riding and getting stronger after slipping a disc in December but is still averaging about 12 to 15 hours a week on the bike. Q: How did you choose the two charities/causes? The Amy Gillett foundation is a cause close to home promoting road safety for cyclists. Sadly we have all either been involved in accidents or have lost friends in bike accidents. Tour de Cure focuses on funding cancer research whilst promoting healthy lifestyles. The support from Tour de Cure has been amazing and they understand the challenges we will face given that they organize long endurance rides on a regular basis. Q: You must have very supportive partners/families, are they part of your support crew? Not this year! Last year Sarah took her partner and close friends as crew but it put too much pressure on those relationships. This year as a team we are still taking people we know but in a more professional capacity – their roles have been very clearly defined and they are coming along in a professional capacity. We’re well looked after by our own doctor, three physio therapists, a bike mechanic, triathletes, super mums and some awesome all-rounders. Q: Are you ready for all weather conditions during the ride? Yes! The heat and wind will be killers but that’s just part of the fun. It will be summer and the desert will be insane but we’ll push through it and I’m sure when we get stuck in a rain storm or the temperatures drop in the mountains we’ll be wishing it was warm and dry. Q: How do you plan to celebrate at the end? Sitting in an ice bath with lots and lots of champagne….and then sleep for a week! We have a dedicated party organiser on our crew team so I’ll sure we’ll be celebrating in style. RAAM also hosts a dinner for the finishers which will be the formal celebration with our fellow RAAM survivors. We’ve been struggling to find sponsors for our event. It’s been interesting to see the responses we’ve been getting versus the responses the male teams have received. It appears that there is still the misconception that females in sport aren’t as marketable as our male counterparts. We’d like to raise awareness for both our charities as well as highlight that female cyclists can do exactly the same as male cyclists (and secretly we’re hoping to beat one of the male teams). We’re looking for a name sponsor who is willing to help us out financially and in return they will receive advertising and media coverage, logos on all our gear and on the support vehicles and RV. Additionally, we’re seeking smaller sponsors to help out. We’re pledging a significant amount to both charities and I hope that we’ll receive the support we need. Well done girls, do it with grace and high cadence. Be proud. God knows we are…..